Researchers have built a plastic cup that changes its color and transparency, using gold nanoparticles and 3D printing. Although they may have not realized it, humans have been using nanotechnology since the Antiquity. Shiny colors in pottery and glass made hundreds and thousands of years ago represent an early usage of nanoparticles — though not many of these ornaments still survive. The most famous example is probably the Lycurgus cup — a 4th-century Roman glass cage cup made of a dichroic (two-colored) glass, which is red when lit from behind and green when lit from in front. The Lycurgus cup is the only complete Roman object made from this type of glass, and the one exhibiting the most impressive change in color. This dichroic effect was achieved by including tiny proportions of gold and silver nanoparticles in the glass material. The exact process remains unclear, and it’s not clear if the makers understood or controlled it or if it came as an accident. The quantities of gold and silver are so minute that they may have been included by accident, as a residue in the workshop or on the tools. Metallic nanoparticles were also used for staining glass during medieval times, the new study reads. Examples of which can still be found in many churches and cathedrals in Europe. Now, researchers have recreated that technique and brought it to the 21st century — using 3D printing. Vittorio Saggiomo and colleagues from Wageningen University have shown how to fabricate a 3D printable dichroic material using gold nanoparticles, jumping from the 4th century Roman glassmiths’ methods to a modern technology. The team used a modified version of something called the Turkevich method to create the color-changing coating. The presented synthesis is easy and fast, taking only a few minutes. During this time, the color changes several times, from the initial yellow solution of the gold ions, to a blue about one minute after the addition of another ingredient (a citrate solution). Two minutes later, the solution turns to a deep black color, before ultimately becoming dichroic after two minutes of boiling. “The time dependent study shows the formation of small gold nuclei that in time cluster together forming nanowire-like structures concomitant to the firstcolor change,” researchers write. “The second change of color, from ink-black to purple, is accompanied by an enhancement of the scattering, giving the purple solution a brown reflection. While boiling, the gold nanowires fragment, creating nanoparticles with a large head and a slim and long tail, comparable to a tadpole. Over time the tail starts to shrink.” Both steps, individually, have been previously studied. Ultimately, the material is dichroic because the gold particles interact differently with different wavelengths, absorbing some and reflecting the others. 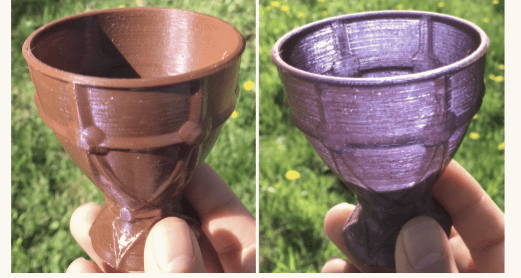 The coating obtained thusly is 3D-printing compatible, and was used for printing plastic “21st century Lycurgus cups”. These particles don’t influence any other physical or chemical characteristics of the cup. The study was published in ChemRxiv.